What Can Science Bring to Religion? Is Rick Warren Launching His Own Magazine? Rabbi Explains "Why Faith Matters"
Rule to Boost Doctors' "Right of Conscience"
Rick Warren To Interview the Candidates—Live! Is Faith Science's Enemy—Or Is It Ignorance? Could Religious Leaders Help Save the Planet? According to a new study released by the Center for Theology and the Natural Sciences, most religious believers would welcome meeting and interacting with extraterrestrials. 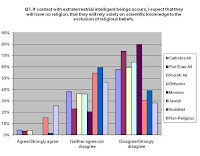 The "Peters ETI Religious Crisis Survey of 2008," led by systematic theologian Ted Peters, was designed to test the idea that the discovery of an extraterrestrial civilization of intelligent beings would lead to a crisis of faith for religious believers and possibly a collapse of religious traditions altogether.